The Special Education Technology Center (SETC) is funded by the Office of Superintendent of Public Instruction (OSPI), Special Education Division and administered by (and housed at) Central Washington University (CWU) in Ellensburg, Washington. The SETC supports educators of any student, preschool through age 21, who formally receives special education services in Washington State and who may require assistive technology to access their education. Services available include: consultations, training, technical assistance, and a lending library. Many of the services are free! Including webinars on a variety of assistive technology (AT) topics. The Lending Library. School personnel can borrow AT devices and software for a 1-month trial (either to use directly with students or for staff professional development). The trials are free; the school district pays for return shipping. Training. 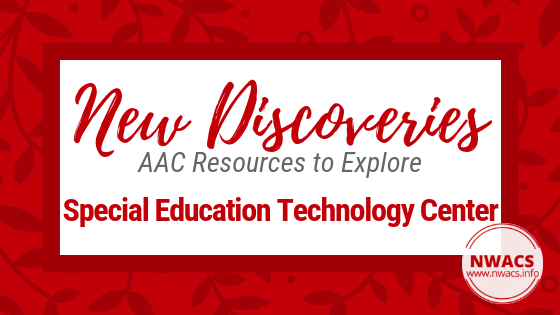 SETC provides professional development on a variety of assistive technology topics including assistive technology overviews, augmentative and alternative communication, alternative computer input, and software solutions for students who struggle with reading, writing and math. SETC also provides district level support on establishing AT processes, as well as planning for and implementing Universal Design for Learning classroom and school environments. Trainings range from free to for a fee. Consultations. Need help brainstorming AT ideas for a particular student or a classroom? School district personnel may request assistance from the SETC when they feel that a student’s learning potential is hindered by a disability-related barrier. Consultations range from free to for a fee. To learn more, and to start accessing services from SETC, visit the Special Education Technology Center website. And if you are attending the 2018 NWACS Fall Conference, look for an information table! The SETC is sending information brochures.